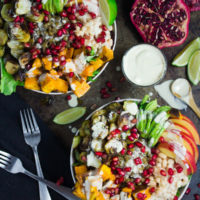 These healthy Harvest Buddha Bowls with Lentils, Roasted Sweet Potatoes, Brussels Sprouts, Apples, Pomegranate Arils and Tahini Dressing are not only gorgeous but also super filling, healthy and nourishing! Pack them for lunch to fuel up for the day! 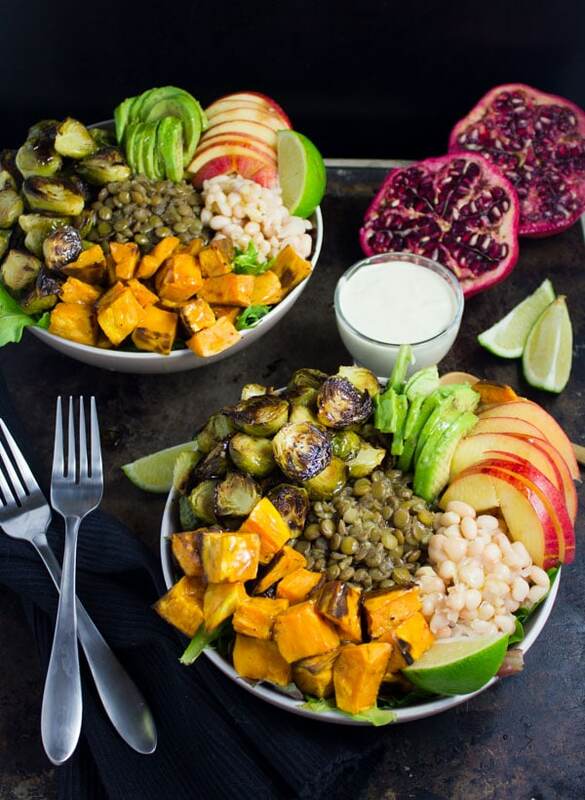 If you’re craving a super hearty, flavorful and filling bowl for dinner—this Lentil Fall Harvest Veggies Buddha Bowl recipe is your best bet! 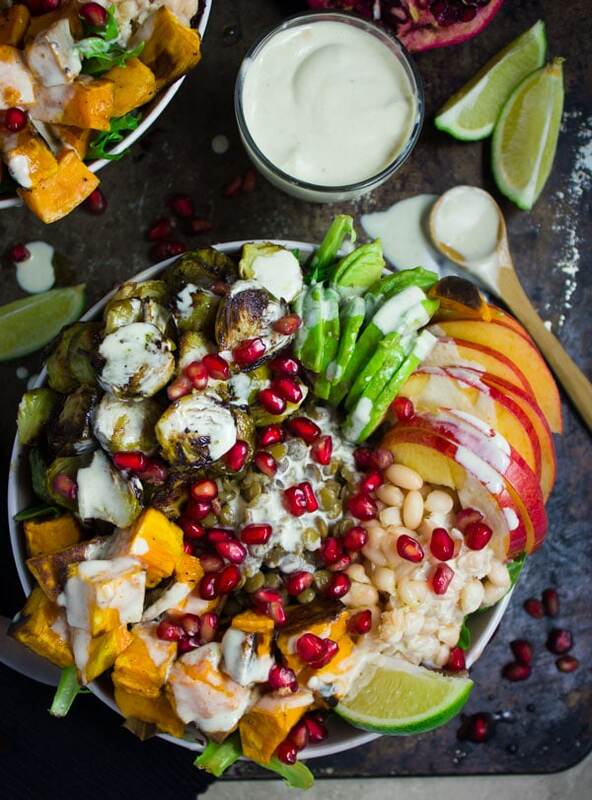 It’s a perfect balance of roast Fall veggies, salad greens, lentils and beans, apples, sweet pomegranate arils and my favourite 1-minute tahini sauce drizzled on top! A melody of sweet, savory, creamy and crunchy. Hello Fall Salads. Hello warm, hearty, filling and nourishing bowls. Today it’s Buddha Bowl time! 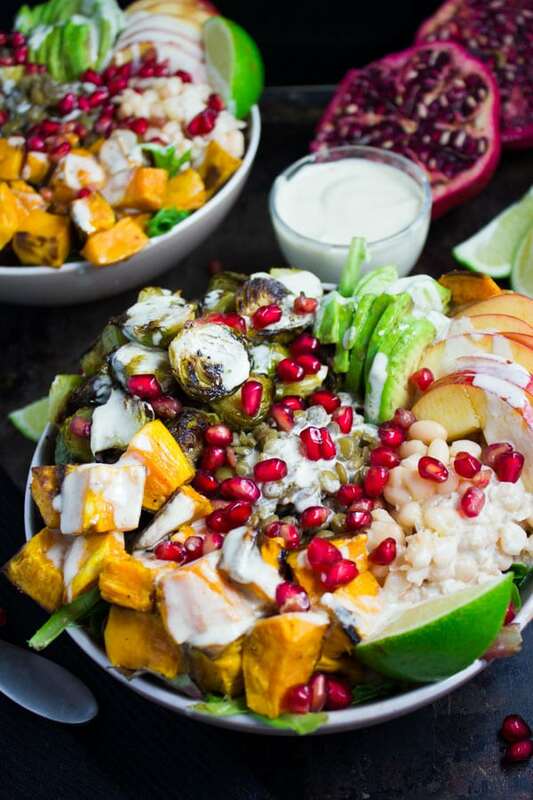 I’ve been intrigued by Buddha bowls for a while and at some point, I researched what on earth a Buddha Bowl actually is – other than pretty I guess?! What on earth is a Buddha Bowl? Why aren’t my everyday healthy salad bowls considered Buddha? Well as it turns out, they are. I actually get to call them Buddha bowl, Bliss bowl, Glory bowl, Glow bowl, Nourish bowl, Hippie bowl, Power bowl…or just GOODNESS bowl! So a Buddha bowl is just a fancy word for “good for you” salad, veggie, grain and protein bowl. And the beauty is, there’s no right or wrong—just get your imagination going. The base of any Buddha bowl is the greens. Preferably organic. Think kale, spinach, arugula, chard, watercress or a mixture. Then there’s the veggie component—and that’s a perfect way to use up leftover roast veggies in your fridge! Roast, steamed, boiled or raw veggies work great—any type and any amount. Now, you need some protein. Go for lentils, beans, chickpeas, tofu, and if you’re a carnivore, go for eggs, beef, chicken or seafood. Then you need a bit of sweetness and crunch and as this is a Harvest Buddha Bowl, I opted for apples, pears, berries, pomegranate arils, mangoes and more. Finally, there’s the grain component which can be rice (brown rice, rice noodles, rice sheets and more), cooked millet, quinoa, buckwheat, barley and whatever else you can think of! Remember—there’s no right or wrong with Buddha Bowls. Now finally, the tahini dressing. 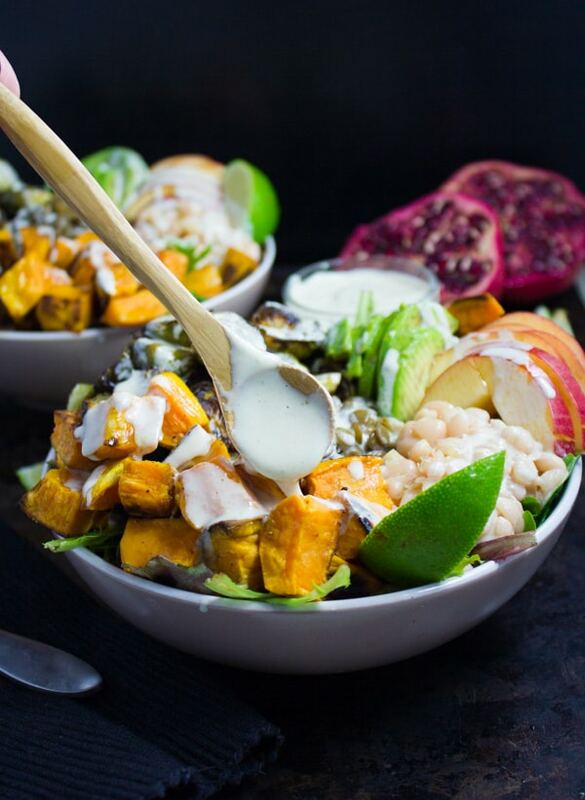 I think no matter what goodies you throw into your Buddha bowl, without the perfect dressing you’ll be missing out on something. So I chose my all-time favorite Perfect Tahini Sauce. It is seriously PERFECT. It’s addictively delicious and yet a simple 4 ingredients sauce that comes together in 1 minute of mixing. I absolutely LOVE it. 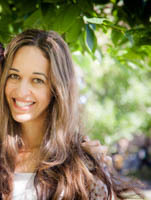 I’ve made it at my cooking classes for a Moroccan dinner night class I was teaching, and it was the star of the night. This recipe was one of the first ones I made for this blog and I confess the photos I took for it are beyond hideous!! So here’s the thing—I seriously hated those sauce photos so much. But one day, one happy reader pinned that Perfect Tahini Sauce and it blew up on Pinterest! I couldn’t believe it. But the morale of the story you guys—this sauce is absolutely PERFECT and worth every re-pin it got irrespective of the bad photos! So now it’s your turn to make it and see for yourself. Now, how do I make Harvest Buddha Bowls with Lentils? I started with a mixture of greens, then I piled on some roasted Brussels sprouts and roasted sweet potatoes. Next, I added in some sliced avocados and sliced apples. For my protein fix, I threw in some cooked green lentils and navy beans. 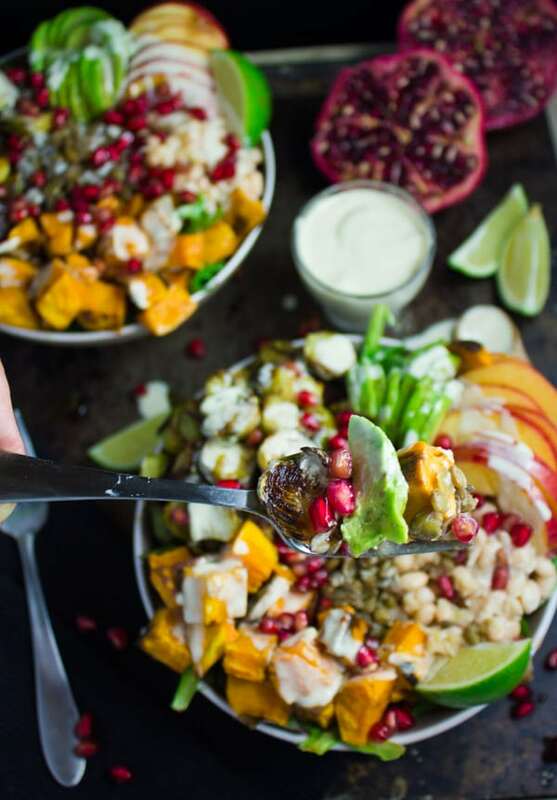 A drizzle of my Perfect Tahini Sauce and a sprinkle of pomegranate arils on top, and it’s Harvest Buddha bowl perfection!! The tahini sauce keeps in your fridge for weeks ( yes weeks!) and you can use it on salads, veggies, spread it on bread, drizzle it on chicken, beef, fish, you name it! 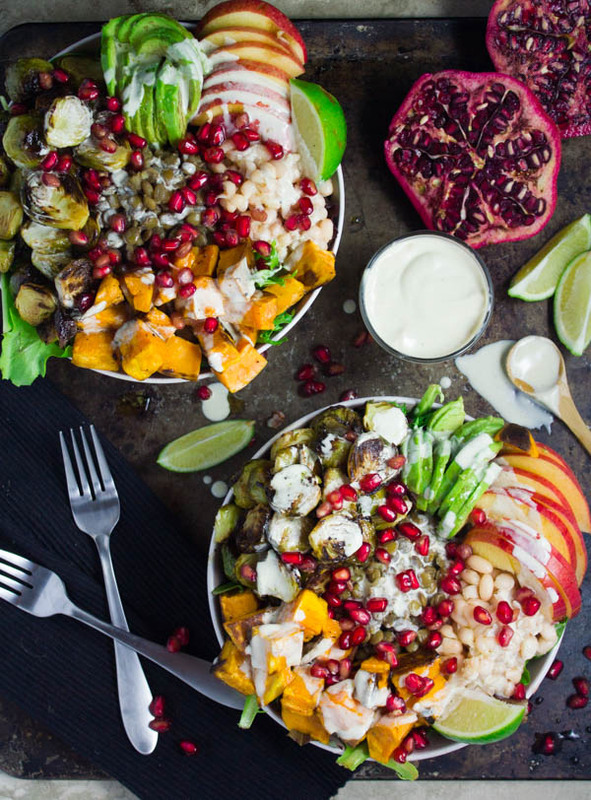 Add whichever grain you want to make these Harvest Buddha Bowls filling and satisfying. Substitute sweet potatoes for pumpkin or add some fried plantains for a Latin twist. Take two bowls, and add the greens to them first. Then, arrange the remaining ingredients all over the greens in any pattern you prefer (leaving the pomegranate arils to sprinkle at the end). 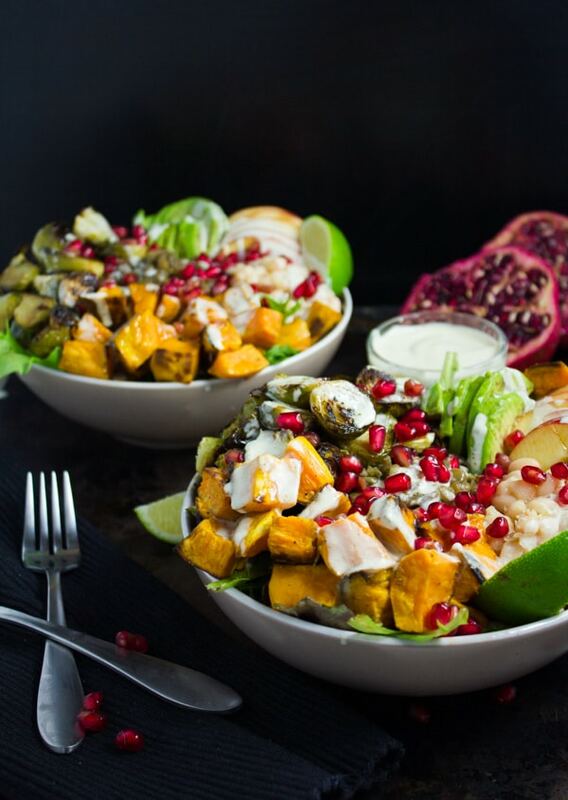 Drizzle about 2 Tablespoons (more or less to your taste) over each of the Buddha bowls and sprinkle the pomegranate arils. Enjoy! Preheat your oven to 400 degrees F. Toss the diced up sweet potatoes and Brussels sprouts (each cut up in half) with a teaspoon of olive oil and pinch of salt. Roast for 15-18 mins. For perfectly cooked lentils, check this Mexican Style Lentil Detox Salad Recipe.